Our yellow labrador and yellow cat died 3 years ago from old age. As far as pets go, we were down to one dog. We felt free, yet it felt like there was a void. We tried to fight the temptation to fill that void with another pet. We lost that battle big time and now we have a small hobby farm. I don’t know what the heck happened, but we’ve never been happier. Everybody says to us, “isn’t it a ton of work?” Yes and no. We have animals because we have kids and we have kids to feed the animals. Very synergistic. Grayson loves his animals and gets paid to feed and take care of them. The latest addition to our little farm is 12 japanese quail. They’re called Coturnix coturnix japonica and we just love them! I was reading a book called Growing & Using Exotic Foods: Living Off the Land , by Marian Van Atta . The author talks all about growing foods in the subtropics and has great recipes. Then, out of nowhere, in the back of her book, there’s one page about raising Coturnix japonica. She clearly loves them and that one page talked me right into going on a hunt to find my own. I searched Craigslist and ended up finding someone who lives right down the road from us. We left her their house with 12 beautiful, healthy quail and new friends. They have a little hobby farm just like ours. 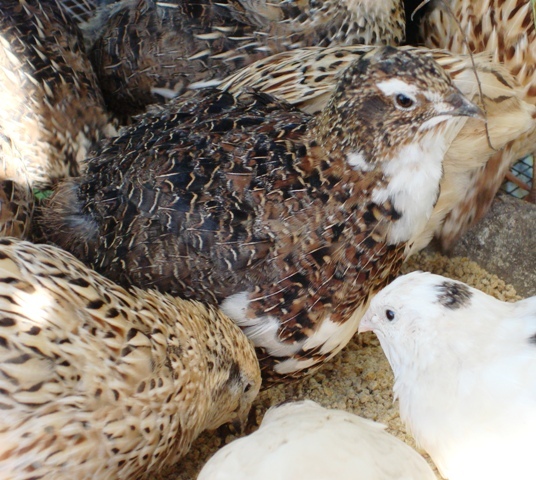 Click here for a YouTube video about raising quail. These little birds are incredibly easy to take care of. I think that’s what attracted me to the idea of raising these quail in the first place. They don’t require a lot of space and they’re not noisy. They make quiet little “whowie” noises when they’re happy, such as the food bowl being set down in their cage. 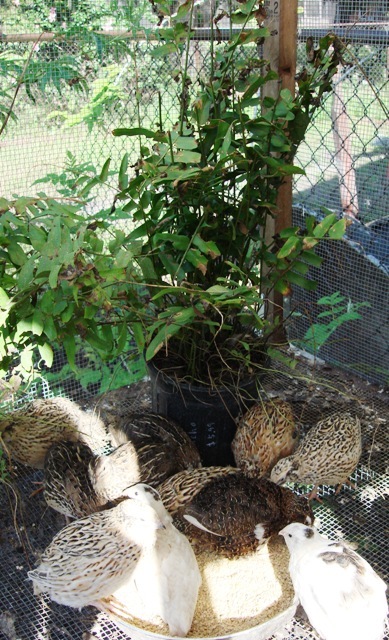 These quail have short life spans (2-3 years). They start laying eggs at 6 weeks of age and incubate their eggs for only 15 days. Isn’t that amazing? They are ground dwellers and like to scratch and forage like chickens. We don’t let them out of their coop though because they are way too susceptible to predators and I doubt they would last a day on their own. I give them huge, flat bowls filled with fresh dirt and mulch everyday. They dive right in and start scratching. I also put potted fern plants in their coop to make them feel like they have something to hide behind. They have boxes to nest in. 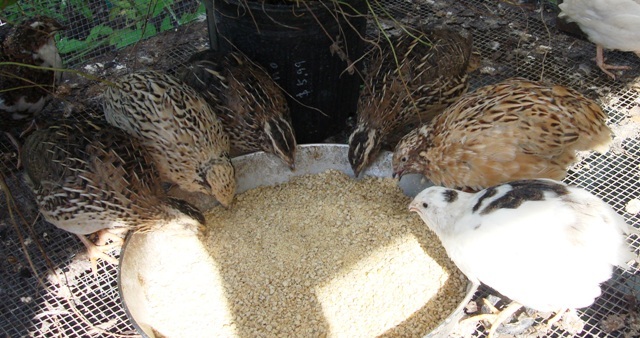 I feed my quail “Flock Raiser” by Purina Mills. Game food works for them too, but the Flock Raiser works for our baby chicks as well. The quail go crazy for it. 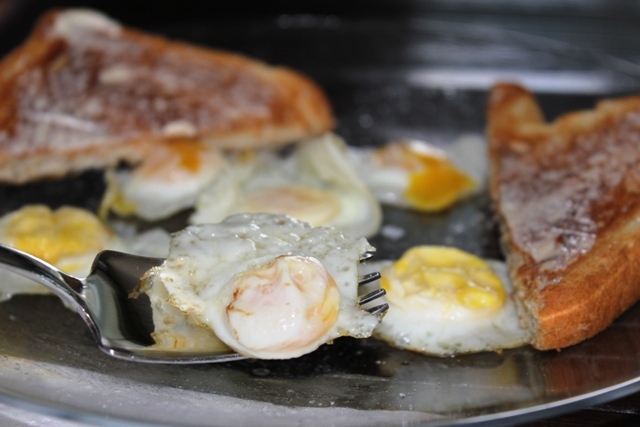 Of course, the best part about these little quail is their eggs! 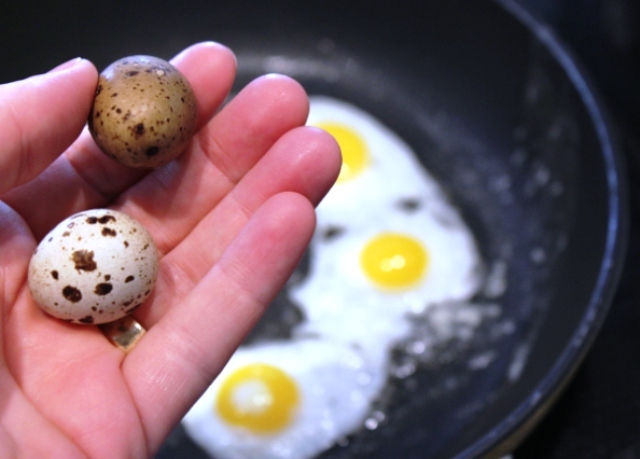 They’re speckled and tiny, but taste just like chicken eggs. 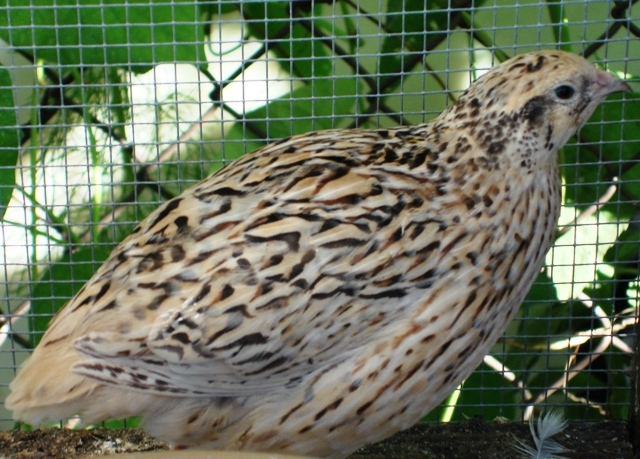 Japanese quail are prolific egg layers. 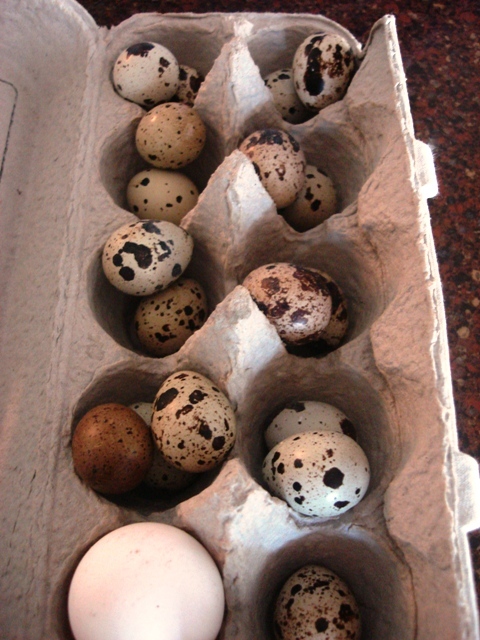 Lots of quail eggs and one white chicken egg. 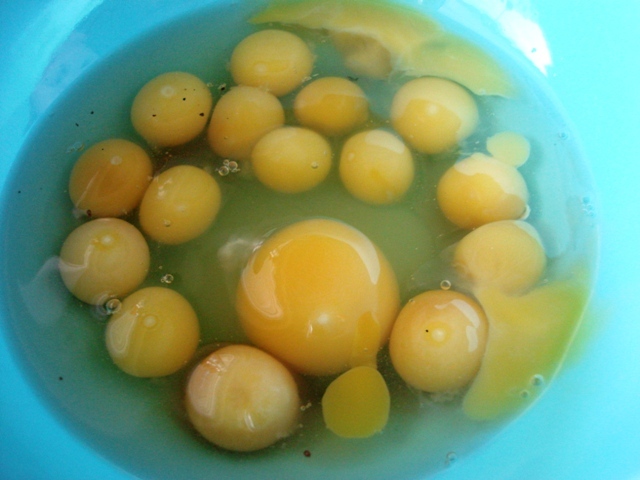 The little yolks are the quails and the larger yolks are the chickens. 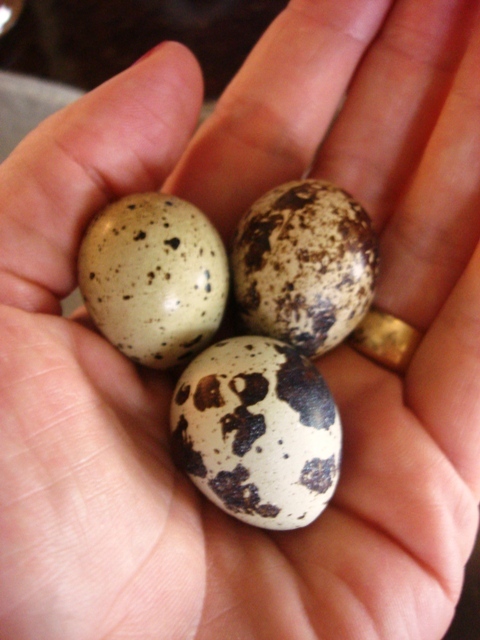 Quail eggs in my hand. I’ve read many times that when you order quail in a restaurant, you’re probably getting the Japanese quail. Well, we don’t plan on eating ours. However, it’s good to know that we have options. 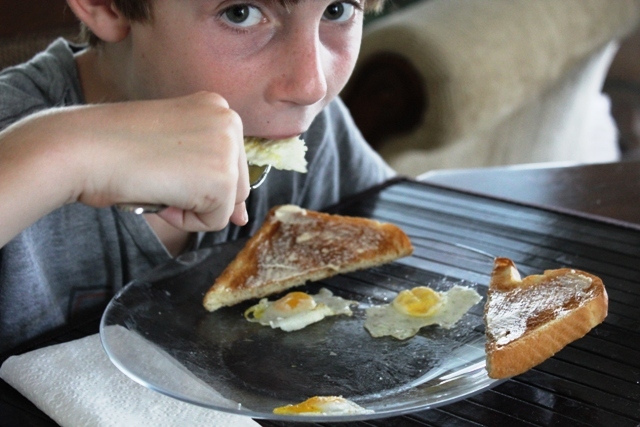 We are eating the eggs though and they are delicious!